RUSH: So here we are on the 30th of November. Now, here on this program, the Christmas season began with Thanksgiving. It always does. But tomorrow, if there’s any doubt, December 1st, it’s really official. And every year, folks, the EIB Network and the Rush website have had an ornament for your Christmas tree as what we call a premium. If you order a new subscription to the website or the newsletter, the ornament will be thrown in as the premium gift, and it was also available in the EIB Store. We’ve changed it around this year. We’ve had for the past couple of months a brand-new Tervis tumbler as the premium for new subscribers to the website, which is encyclopedic. I mean, I could spend 10 minutes extolling the virtues of RushLimbaugh.com. It’s got a free side, too, that has so much information on it you couldn’t possibly access it all. But the paid side has got even more. We’re just so proud of it, I can’t begin to tell you. I don’t really extol its virtues enough here. And then, of course, there’s The Limbaugh Letter. We’re changing things up this year. Rather than the Christmas ornament become a premium, we this year are installing it as a sale item in the EIB Store, and new subscribers from now ’til the end of the year will continue to get the brand-new Tervis tumbler. I’m holding the Tervis tumbler up right now on the Dittocam. Let me put it on the side camera, maybe a little closer. There you go. Tervis tumbler. It’s excellent at keeping cold beverages cold with no sweat on the outside. I even drink my coffee out of it because it keeps warm beverages warm much longer than a standard glass or cup. But I want to tell you about the ornament because we’ve gone all-in on the Christmas tree ornament this year in honor of almost 30 incredible years on the radio. We commissioned a wonderful American company in a small town in Pennsylvania to handmake our special — these are hand-forged special edition Rush Limbaugh EIB Christmas ornaments. And they’re one of a kind. These exclusive ornaments, folks, they’re stunning, particularly compared to the ornaments that we have distributed in previous years. I have one here, I can hold it up on the Dittocam, but I’m not gonna do that. I’m gonna take a picture of it, and we’ll put it on the switcher. I wouldn’t be able to get close enough to show it to you, and a close-up shot will give you more detail of it. But you’ll also be able to see it at RushLimbaugh.com. It is a work of art. There’s an American flag proudly placed in the center of the circle with America’s Anchorman, the EIB Network logo, and my name etched around the flag beautifully. And there is a special quote from me hand stamped on the back and the year. Now, we got to see these ornaments being hand forged. We actually sent our design crew to the factory in Pennsylvania where these are made to watch them be hand forged. It was incredible. You would not believe how many steps are involved making these ornaments just looking at it. But they are quality works of art. And the people that we commissioned to make them are the best in their craft. They’re right here in America in Pennsylvania. It starts in the art department with our design, goes to the master engraver, it gets cut, it gets hand hammered, it’s then polished. Every single ornament hand tied with a ribbon for you to hang on your tree. All handmade by Americans. 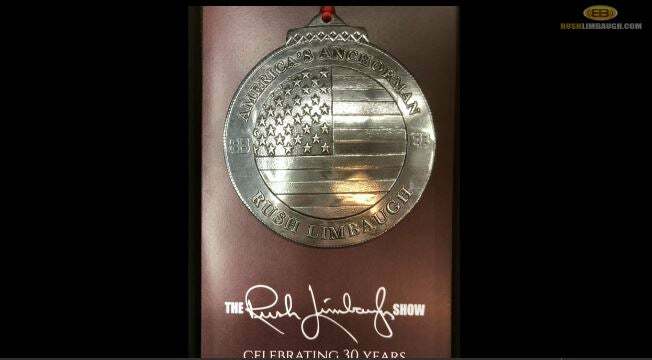 There is no question this year’s EIB Rush Limbaugh ornament is one of a kind, a collector’s piece. We have a limited supply, so be sure to act quickly if you would like one. Don’t say I didn’t warn you if we end up being sold out here. Well, we’re not gonna try to Apple iPhone you on this. We’ve got a significant stock, but I mean don’t wait too long here. The ornaments are handmade. We can’t just mass produce these things with a phone call. So go to RushLimbaugh.com and scope them out, take a look them, you’ll find them at the EIB Store. RUSH: I just snapped a picture of the ornament in its box and I put it in the switcher here at the Dittocam, so there it is, folks. That ornament, that’s probably three and a half inches in diameter is what you’re looking at there. That is hand forged, hand stamped, and the year and pithy saying is on the back of this thing. But that’s actually taken in the box that it comes in. You can’t see the ribbon at the top, but there’s a red ribbon attached to it at the top that you can use to hang on the tree. You’ll also be able to see it at RushLimbaugh.com, but it’s a special endeavor this year. And it’s not a premium with new subscriptions to the website or newsletter. It is for sale individually at the EIB store at RushLimbaugh.com. Now, I realize this is frustrating for those of you not watching the program on the Dittocam. The Dittocam is part of the subscription or member side at RushLimbaugh.com. You can watch the program on an app on your phone or your iPad, or you can watch it later. You can watch hosts of programs from the past later, or listen to the audio streaming. There are podcasts of each program each day made available about 30 minutes after the program, and they are all without commercials, if you watch them on a delayed basis. 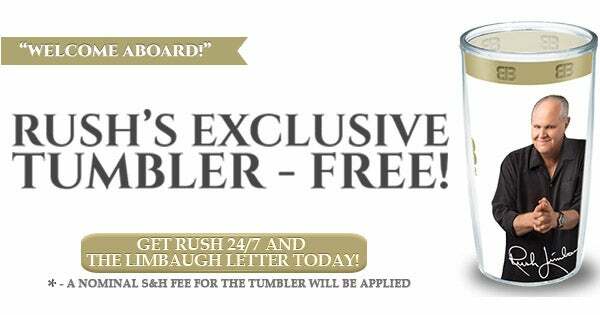 So that’s just one of the many benefits of membership at RushLimbaugh.com.